Your Trip Leader will pick you up from Reykjavik-Keflavik International Airport and we'll head to downtown Reykjavik in included transportation (45 minute drive). Suggestions: Hallgrímskirkja Church, National Museum of Iceland, the Settlement Exhibition. Arrive at your guesthouse in South Iceland and get settled into your new home for the next 5 days (~2 hour drive). Go for a walk around the beautiful property as you begin to take in the magic of Iceland. Enjoy a delicious Icelandic meal at our opening dinner. Get to know your other like-minded travelers and begin to settle into Iceland together. Wake up in the Icelandic countryside and enjoy your freshly made breakfast. Start the day by visiting Seljalandfoss Waterfall. Your Trip Leader will also show you the “hidden” waterfall right around the corner. Take a ferry off the coast of Iceland and spend the afternoon exploring the Vestmannaeyjar Islands. Hike Eldfell, a volcano that erupted in 1973, and enjoy breathtaking views of the island and the North Atlantic Ocean. Don't want to hike? We suggest visiting the Volcano Museum of Eldheimar! Have a delicious homemade dinner at your guesthouse. *The harbor to the Vestmannaeyjar Islands is currently undergoing maintenance. If we're unable to board the ferry, we'll visit Reynisfjara Black Sand Beach instead. Visit the Lava Centre: a state of the art, interactive exhibition on volcanoes and earthquakes in Iceland. Check out Seljalandsfoss waterfall, and a “hidden” waterfall nearby. Have lunch at a local Icelandic farm. You will have the option to ride Icelandic horses to a secluded waterfall beneath what used to be sea cliffs. Not your thing? Hike the surreal landscapes instead. Watch the sunset from the famous Reynisfjara Black Sand Beach while you and your new friends check out the basalt columns and lava caves. Return to the hotel for another home cooked dinner. Cross your fingers for a clear night and hope to catch a glimpse the magical Northern Lights with your new friends. A traditional Icelandic breakfast will be served at your guesthouse. Hike Thingvellir National Park where the Eurasian and North American tectonic plates meet. Learn about the history of Thingvellir and how it became the place where the first democratic parliament of the world was created. Then, head to the hamlet of Laugarvatn to experience the Icelandic way of baking rye bread in hot springs. Relax in geothermal pools and enjoy a beautiful view of Lake Laugarvatn from the steam baths. Later in the afternoon, stop at Gullfoss Waterfall, and marvel at the beauty of this iconic waterfall. Enjoy another delicious dinner at your guesthouse with your group. A homemade breakfast will be served at your guesthouse. Visit Skógafoss, a beautiful waterfall connected to the famous Eyjafjallajökull glacier. Climb the steps that will take you to the top of the waterfall and go for an optional hike. Refuel at a local restaurant with your group before your next adventure. Drive over to Sólheimajökull glacier where you'll meet your glacier guides and hike onto the face of the glacier. Learn more about glaciers and how Icelanders care about preserving nature. Enjoy your last night in Iceland with your new friends and a delicious final dinner at your guesthouse. *For Northern Lights trips starting on Thursday, Days 3 and 4 are switched. Say goodbye to your guesthouse and take included transportation to Reykjavik-Keflavik International Airport (KEF) (~2 hour drive). If you're flying home today please be sure your flight departs after 3:00 pm. If you wish to go to the Blue Lagoon today, please book your ticket online (after 12:00 pm) as soon as possible since pre-booking is required. Under30Experiences will drop you off at the Blue Lagoon on our way to the airport. 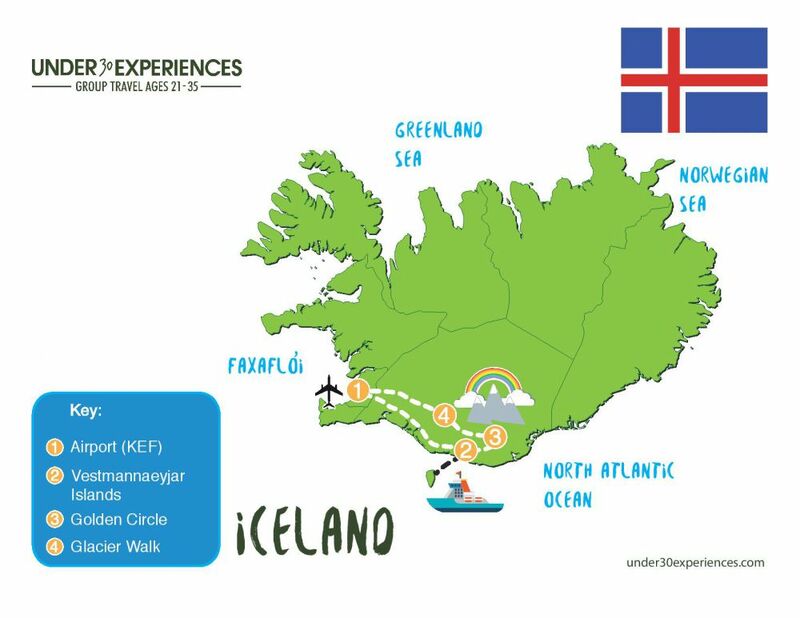 Under30Experiences can provide transportation back to Reykjavik for travelers extending their stay in the beautiful capital of Iceland. Check out this video of our Iceland trip!